There are times, and this is one of them, where my ongoing choice to stay away from public events and electoral politics no longer stands up to my inner sense of moral integrity. This is a time where I am just too clear that it’s only my privilege that makes it even an option to choose. No, I don’t think that privilege is “bad,” nor do I aim to make it go away, nor believe it’s possible or even always desirable to do so. Rather, I want to consider my privilege as a resource, and to keep asking myself day in and day out how I mobilize my privilege and use it for the benefit of all. In my position of privilege, I can write whatever I want about Ferguson, and I don’t risk losing a job, alienating people who can make my life miserable, or possibly even more imminent physical risks to my body. I want to be taking the most risk that I can in speaking as much truth as I know, with as much love for all as I can muster, because this is my creed: truth with love, and with enough courage to face all consequences. This is one small part of a larger aim I have regarding privilege. I want to find ways of getting those of us with privilege to recognize and own it without defensiveness or shame, and to become loving stewards of the resources given to us by the history of racism. Stewarding resources means to me that we know it’s not “ours” to own or use for our personal gain. This is my understanding of Gandhi’s idea of trusteeship, which I see as a major step towards a world that truly works for all. I plan to come back to the very complicated and exceedingly painful topic of privilege soon. In this particular case I want to name, explicitly, that this piece is written for a white audience: I am offering one idea about what we, as white people, can do. And if you want more, many more, you can read 12 Things White People Can Actually Do After the Ferguson Decision. My writing this piece is part of what I mean by stewarding my privilege: that I can speak to white people in ways that people of color can’t easily get away with. Speaking with other white people, making it a priority to continue to have such conversations even when they are uncomfortable, is part of what I hope to continue to do. Imagine if many more of us took the step of committing to learn about the history that preceded this particular event; to continue to engage with an intention of doing all we can to bring about a future without racism; to be willing to dismantle and re-vision all systems that we take for granted and that perpetuate racism in our name. There will likely be people of color who read this piece, even though it’s intended primarily for a white audience. For you, whoever you are, I want to offer, first, love and an acknowledgment that I will never understand your experience fully; I only know that these events, and the history and systems that perpetuate them, are affecting you so very differently from how they are affecting me and white people more generally. I am not in a position to imagine what kind of response would make sense for you to have, nor how I might respond if I were in your shoes. I also want to acknowledge that in writing this piece, in coming up with my own idea, without first checking with local and national people of color organizers, I am skirting near an existing pattern of white people thinking we know best what to do in any given situation. I know I want to grow in my capacity to listen to you and follow your lead. I want to engage with you about this writing – what I am saying and how I am saying it – to whatever extent makes sense for you. I am grateful to a number of people for getting me here, directly or indirectly. First, two women I don’t know. 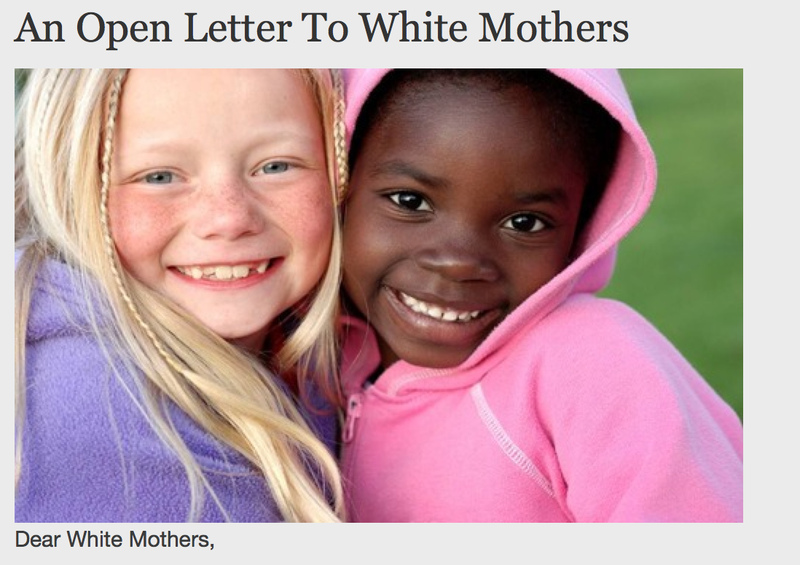 One of them is Keesha Beckford, a Huffington Post blogger, who wrote a letter to a white moms from a Black mother. The other is a white woman by the name of Paige (no last name that I could figure out), who wrote an open letter to white mothers. Coming from two dramatically different and complementary perspectives, their writings were what got me over the edge of hesitation. I urge you to read them. I cannot imagine any way that I can do their letters justice. They drove home to me the point about doing something about the ongoing devastation that is continuing to happen in Ferguson, as well as the less visible and continuing incidents of similar deaths that have been happening all over the US for years and years. I am also grateful to a number of other people who have supported my journey over the years to get to where I am, especially recently. They are too many to name, and I still want to acknowledge them, because, with the exception of my sister Inbal who died so prematurely in September, they are all people of color, friends and students and colleagues, and I don’t want it to appear as if I came here all on my own. Some of these conversations and shared learnings were exciting and easy for all of us. Some were profoundly challenging, and I am particularly grateful for the care that was given to me by people who stretched a long way to stay in dialogue with me even when I was not seeing things that they could see and even when doing so may have been painful for them. I am especially grateful to Uma Lo and Ya-Ping Douglas for extraordinary and courageous feedback on earlier versions of this piece. One day soon I plan to write and acknowledge them all. Today, the more urgent task is to speak about what is happening now, not about my own journey here. Because violence is continuing to happen, and, perhaps, there is something that could be done, even if I myself cannot do it, to stop and transmute the violence. I read a quote the other day: “White privilege is the ability to be outraged by the Ferguson decision, rather than be terrified by it.” Reading it, I instantly got the tragic truth of it, and, with it, I felt alienated from the sentence. Although I am white, I am terrified by what I know that’s happening in Ferguson. Any time levels of brutality like this are directed against anyone, anywhere, and I know about it, I am terrified. Just that humans are able to do certain things to other humans frightens me, because I then have to struggle mightily to continue to see the continuity between me and those who are doing the brutality, and to grasp in full that they are human even when they do it. In this case, I also know something of the history of hundreds of years of a systematic assault on Africans, starting with slavery and continuing, and continuing, and continuing to this day, which makes it all the more acute and painful. Knowing and not knowing, because I have never been in those shoes exactly; I don’t know what it is to fear for my life on a daily basis. It frightens me to know that only 16% of white people in this country believe that Blacks suffer serious disadvantages; that so many say that it’s incidental that the police officer is white and Mike Brown was Black; that so many want to just accept the grand jury’s decision and leave behind the agony of African American communities and other communities of color. It frightens me because I don’t know what to do to create the transformation that would make it impossible for this level of terror to continue. It comes back to such difficulty in grasping how anyone could do what the officer in question did, to anyone else, and what the police as a whole have since done in Ferguson. I also know all too well that as soon as any group is made an OK target for violence and brutality, no one is safe. It’s young Black males in the USA in the last many decades; it was Jews in Nazi Germany; it was certain groups in Cambodia. The door opens, and there is no telling who would be target tomorrow. I am also feeling distant from this sentence because I am not finding outrage in me about this, and this is the part that feels scary to say. I am feeling deep and profound heartache, not outrage. I don’t recall ever feeling outrage, not even when I learned, slowly over the years of my childhood, about what the Nazis did to my people, the Jews. I don’t feel outrage, and, still, absorbing and transmuting others’ hatred, cruelty, brutality, or just cold distance takes a huge toll on my soul. Somehow, from early on, I held myself to some immense standard of being able to hold it all and remain open-hearted. I rarely succeed, because it’s too much for one person, alone, to hold it. The effort leads me to internal collapse, despair beyond words, and a loud and silent scream that arises in me any time I hear of cruelty. I have the privilege of being able to protect myself from the events in Ferguson, because I live here, in Oakland, in a part of town that is mostly white, mostly middle class, where such events are far less likely to happen. I don’t “have” to face it. I can, and did up until today, stay away from exposing myself. The people who live in Ferguson, and everywhere in the US where Black people face active violence, in Palestine, in all the places where active violence is daily life, don’t have that option. How do I mobilize this privilege? I wish I had more energy at this time, because if I did, I would organize an NVC delegation to Ferguson with the clear and strong intention of stopping the violence. I cannot, because my sister’s death and its aftermath has left me without resilience. It’s “easy” to write about this. It would be beyond my capacity to organize a trip, or even to go if someone else organized. I don’t trust myself, at this time, to be able to find enough open mystery in my heart to generate the love I wish to display for all. I don’t see myself able to overcome the many losses I have endured in this recent past, on top of losing my beloved sister, and, through them, to rise to love, to reach out to others who may join me, to join others, and to expose myself to violence of any kind. And, still, I want something to happen, something to stop the violence. Maybe, just maybe, if I write out my thoughts, someone else will pick it up, and something will happen. If I were to organize a delegation, this is what I would hope for it to do as my dream of how the violence could be stopped; in Ferguson this time, and anywhere where humans have taken some group of people and put them beyond the pale, officially less deserving of care. I would want a group large enough and loving enough that we could stand and protect the people who are being targeted by the police; literally put our bodies on the line to make sure they are not harmed, because the police would have to harm us first. This, to me, is a way of using our privilege in service to others. I do not mean it as a symbolic act. I mean it as a deep and serious commitment to transform the dynamics on the ground, intercede, like third party nonviolent accompaniment all over the world, to bring physical safety to those who are being targeted. By those targeted I mean the demonstrators: I am calling for protecting them from the militarized police. A public demonstration of putting white bodies on the front line of harm to Black bodies may just do the trick, in the same way that it was the killing of white people in the south in the 60s that galvanized many whites to notice the Civil Rights movement. This is the first and deepest commitment of any act of nonviolent resistance: I am willing to endure suffering; I will not dish out suffering to anyone else. As people like Gandhi and Martin Luther King knew, and others like them, known and unknown, our willingness to endure suffering is one of the very ways we can reach the hearts of those who are at present committed to cruelty. Nonviolence implies a willingness to trust that everyone is redeemable, even if we don’t know how to do it. When we expose our own vulnerability, we invite theirs. There is also the strategic aspect of it: police are far, far less likely to harm a large group of white people, especially a large group of white people coming from out of town, than they are to continue to harm local Black citizens. Our presence there could potentially serve as a rapidly de-escalating presence. If enough of us are there. In short: such a group could possibly create a de facto separation between the police and the residents, as well as giving the residents a sense of being accompanied and witnessed, so that they might experience their plight as mattering to someone. Meanwhile, others might meet with the police and anyone else who is actively committed to the repression going on in Ferguson, and engage in dialogue: listen with care, find the deepest meaning that people have, what they care about, what matters to them so much that in the name of it they are willing to do so much harm. Once that is clear, once they know that their humanity is seen, not just that of the Black people whose plight is all over the media, there can be some opening. Because condemning them makes them the next group that is outside the circle of care. Then it’s OK to punish and shame them. This will not stop the violence, only push it forward to the next cycle. What I long for is a way to see everyone’s humanity without losing sight, in the very same moment, of the enormous suffering of people of color at the hands of the police, happening mostly in a context of silence on the part of most white people, many of whom see the humanity of the police more than the humanity of the Black people who are being killed. At this point, speaking with such intensity, I want to reiterate that this invitation is issued to white people. Whatever other history of genocide and persecution I carry within me as a Jew, the particularities of what happens to people of color in this country, on a daily and persistent basis, over hundreds of years, are different enough from my own that I am in no position to imagine or tell anyone how to respond. Anything else, any expectations about how I would want people of color to respond, would be, in my mind, a blind exercise of my white privilege. Any unconscious exercise of privilege is likely to reinforce it. None of us know what could bring peace and transformation to this situation, and certainly not to the overall crushing reality of persistent targeting of young Black men. So many of us feel utter despair and don’t know how to respond. The very fact that all of this continues to happen affects our souls so deeply that the energy required to transform it is lacking. As I wind down this piece, I want to consciously remember to hold all of us with compassion, whatever our response. I also want to note, again, that we are not all in the same place. Privilege matters even in our helplessness. My friend Victor Lewis said it most simply: we are all on the same boat, on different decks. If the boat sinks, we all sink. Until then, our experiences are different. 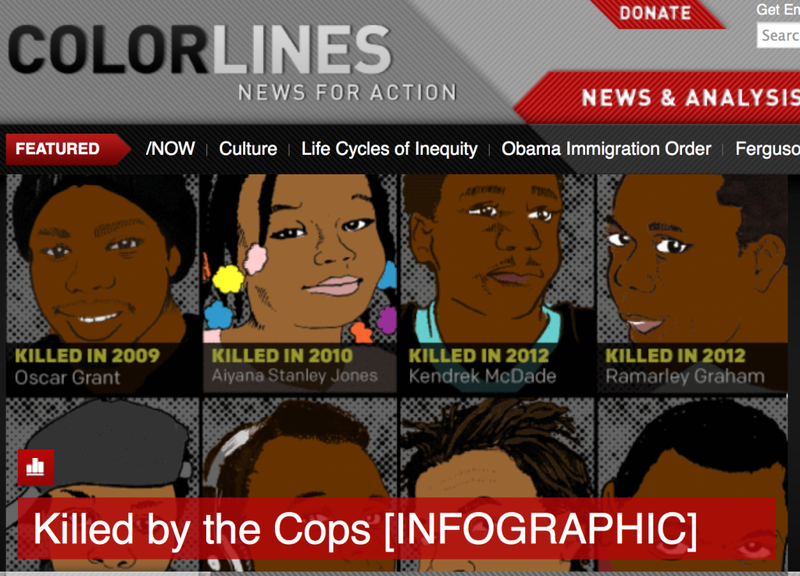 Images came from: Vox, Huffington Post, Our Road Less Traveled, Colorlines, Southern Poverty Law Center. This entry was posted in Uncategorized and tagged Ferguson, racism, Uncategorized on November 29 / 2014 by Miki Kashtan.